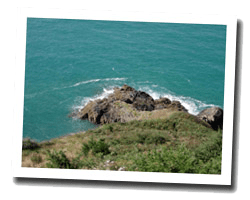 Côte d'Émeraude (Emerald Coast) is the name given to the part of the north coastline of Brittany between Cancale and Cap Fréhel because of the emerald green colour that can take the sea. Rocky rugged coastline and numerous islands offer stunning landscapes. At the seaside you can find many beaches and coves with fine sand. 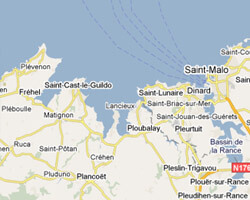 There are two of the most famous seaside destinations in Brittany: Dinard and Saint-Malo. On the Emerald Coast enjoy a seaview holiday rental. in a ancient shipowner House. view of St Servan harbor. Close to the Beach. 3 Bedroom(s), 2 double bed(s). Final cleaning : 50 €. 1 Bedroom(s), 1 double bed(s). short stays possibility. Final cleaning possibility. Apartment located on the 6th floor of a building facing the sandy beach of "Sillon". 3 rooms apartment 66m2. Jacuzzi. Pets allowed. 2 Bedroom(s), Final cleaning : included. 2 Bedroom(s), 1 double bed(s). short stays possibility. Final cleaning possibility. 3 rooms apartment 60m2. Close to town centre. 3 rooms apartment 60m2. Close to town centre. balcony. Apartment block "Porte St Louis", 5 storeys. St Malo intra muros, in a central, quiet position, 300 m from the beach, south facing position. 4-room maisonette 72 m2 on 5th floor, south facing position. Beautiful view of the sea and the port. 4 Bedroom(s), 3 double bed(s). short stays possibility. Price from 444 € to 1206 €.